Frequently Asked Questions No:2 Do you pay for the film? Can you keep it afterwards? What a glorious thing that would be, not having to pay for the film. I’d be typing this on my gold plated keyboard after having sent another flunky out for battered swan nuggets, just because I could. Of course I’d soon be forced to show my old holiday slides as the films would eventually dry up. I’m pretty sure you wouldn’t pay to see snaps of me squeezed into a pair of Speedos on some Mediterranean beach. So yes, we pay for the films. I think there should be an independent cinema owners lottery. Once a year we get a film for free, the title pulled out of a hat. It could actually make a genuine difference if a good one came up. Knowing my luck I’d get The Three Musketeers. The question that usually follows is how do we pay? My first reaction is through the nose. but I would say that wouldn’t I? Put simply we pay a percentage of what we take. That percentage varies depending on the film, big titles cost more. Quite a lot more. In days gone by, until fairly recently actually, films were paid for using an arcane sliding scale system. Cinemas would have what we doctors call a “break figure”, supposedly to reflect running costs. For round numbers sake let’s say that figure was £1000. The cinema pays 25% of the first £1000. Then 75% of everything over that. Yep, 75%. There were a few other calculations too boring to go into here. This was on a per week basis. Essentially the more you took the more you paid, hardly an incentive to put on more shows. As an independent we weren’t in a position to negotiate the posh break figures circuits had, meaning some of the percentages we paid were toe curling. Fortunately things have changed somewhat and some sanity has made its way into the system. We now pay flat percentages, far more preferable. These can range from 30% to 60%. It also means putting on more shows doesn’t affect the percentage. Marvelous. Before you go judging me for complaining about a business that makes between 70% and 40% gross profit, remember that payment is made to the distributor before any of our running costs are accounted for. It’s also worth remembering that our running costs remain the same however well or otherwise the film does. It costs the same to open whether we have one or a thousand people through the door. A lot of weeks lose money, so we’re quite often playing catch up. Over fifty two weeks it works out, but it can get very hairy at times. Spare me a thought next summer when you’re all watching the Olympics and the Euro football and waving your poxy Union Jacks at passing Queens, and I don’t mean at gay pride in Brighton. And yes I know there’s popcorn as well. See previous post for that explanation. As for keeping the films? 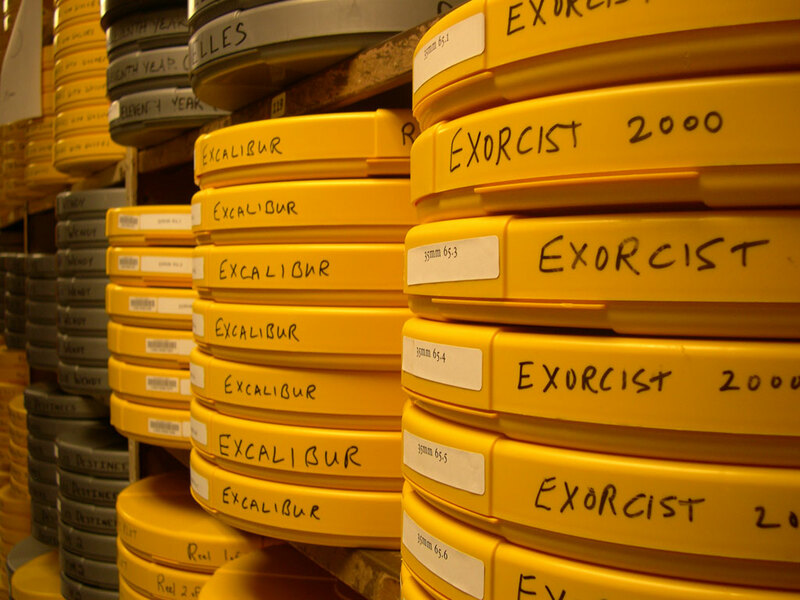 In the olden 35mm days certainly not, prints are expensive and are moved around the country to other cinemas. Sometimes to other countries, where the release follows ours. Besides they don’t belong to us, they belong to the renter. The clue is in the name. If we did nick them, where the hell would we put them? Film is bulky and stored in warehouses. I don’t have a warehouse set aside for illegally procured film prints. Theoretically we could keep copies of digital films, but they’re no good without the digital key that allows them to play. A key will only allow the film to play over a set time, so all I’d have is gigabytes of data I can’t access. Let me know if there are any less frequently asked questions you have a burning desire to know the answer to, preferably cinema related, and let’s see if we can’t make some interesting blog posts out of them. ← Frequently Asked Questions No:1 So What’s Your Favourite Film Then? Hi Kevin. Does the digital key allow you to play the film as many times as you like in a given period and, if so, do you ever put on a sneaky viewing of a film on the big screen just for yourself? I have visions of you watching a film on your own at 1am with the sound system cranked up to 11…!!! I have a question for you Kevin. I love me a good trailer, and I was wondering do you get to choose which trailers get shown for each performance, or is it fixed by the distributor? We choose the trailers based on the feature, and what will appeal best to that audience. Doesn’t always work out as surprisingly material not always available. Why is the Cinema always so dirty in the evening? I’m actually just writing about this. It isn’t of course. It may have been messy if you came after a busy half term day, but dirty it is not. Outside of holiday times it is certainly not messy in the evenings.